Long gone are the days when mobile phone was primarily for talking; constant technological evolution of mobile and entire electronics sector has revved up mobile phones to become powerhouses. Razer Inc has launched the company’s first smartphone known as Razer phone particularly targeted towards the mobile gamers community, a market which received less attention over the years. The American company was the pioneer in engineering hardware for PC games, thus mobile gaming enthusiasts can expect top-notch delivery upon their promise from the company. The device has 5.7-inch 1440p display with industry’s leading refresh rate of 120 Hz and whopping 8GB RAM, 64 GB expandable up to 2TB storage using microSD card. It comes with loaded ultra-motion technology that enables users to play graphic-intensive games without any lagging. 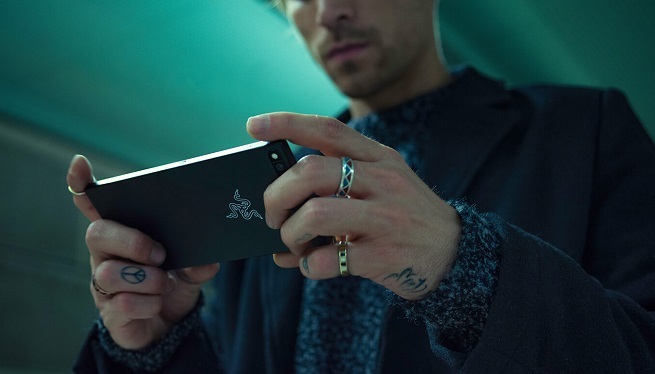 The Razer Phone features a pair of front-facing stereo speakers with 24-bit DAC and Dolby Atmos audio, with a dedicated amplifier for each, and the whole package being THX certified (which is a smartphone first). Further, the company has claimed that Razer is the loudest smartphone till date. Those of you who are among the peer that tend to break your beloved handsets, good news for them: Razer adorns Corning Gorilla Glass 3 with Native Damage Resistance (NDR), fundamentally tougher and more damage resistant. Similarly, the razer does not disappoint in the processor unit as it is powered by Qualcomm’s snapdragon 835 processor and truly long-lasting battery of 4000 mAh. The gaming enthusiasts now do not have to distress about battery draining out while embarking on an adventure or defeating villains in their favourite game as Razer Inc powered the device with low charge consuming IGZO display. Although the camera specifications are not the best in industry with 12 MP dual rear camera setup and 8 MP front-facing camera but justified as the company is attempting to grip the niche market of gamers community. One camera has a f/1.8 lens for wide shots and the other is a telephoto f/2.6 shooter. In terms of visual appeal, the device may not be the most elegantly crafted in the competitive market of iPhones and other sophisticated designed Android phones with a block design made up of aluminium and thick bezels encircling top and bottom of the device. Similar to iPhone 7 onwards Razer does not have headphone jacks instead comes with THX audio dongle to allow hooking up headphones and promises 24-bit “audiophile-quality” sound. There have been arguments whether Razer does stand out as a gaming smartphone or not since OnePlus already sells 8GB RAM powered devices, other competitors use snapdragon 835 and the software augmentations boil down to game booster app that functions like a secondary settings menu. Even for user interface Razer Inc kept very primitive choices with stock Android Nougat 7.1.1 with Google Assistant and the premium version of Nova Launcher preloaded. Razer is priced at $700 (Approximately BDT 58,128) set to ship from November 12 in North America.